This week for our Virtual Book Club Summer Camp The Educators' Spin On It, Rainy Day Mum, and I have been finding all sorts of ways to play and create with books in the garden! Here are 14 book-inspired garden week activities that we've enjoyed! Click on each link for more details about how to do each activity. Plus, I'm including two bonus activities in this post... watering a chalk garden and making plant markers! 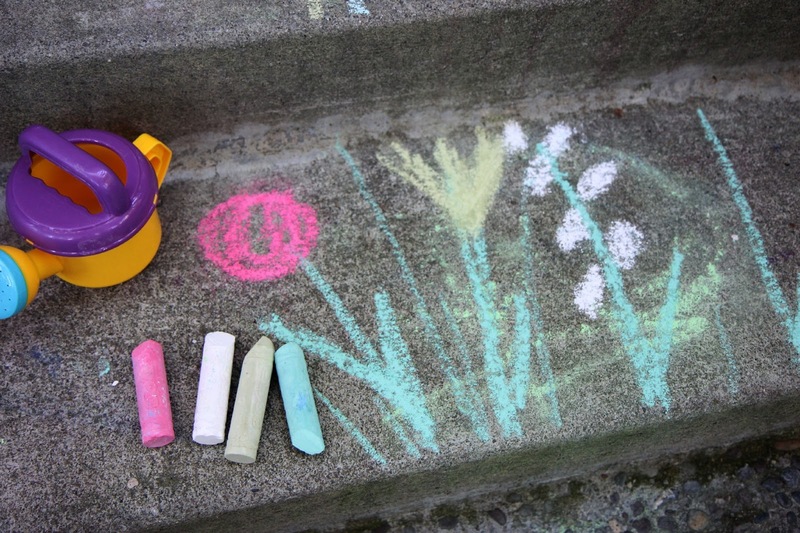 Watering a chalk garden is simple & fun activity where you might also get a bit wet. Just draw a chalk garden on the pavement and then grab your watering can (we got ours for $2 at Target) and make it disappear! We talked about colors and shapes and learned names of the real flowers we read about in Planting a Rainbow by Lois Ehlert while we drew. Grab some simple plant markers at a local gardening center, then get some markers and start writing the names of the plants in your garden on them. We played pretend garden, since we don't have one... so the kids made up the names of what was in their garden and buried them in the ground. This was a great writing activity. I loved watching the kids sound out new words or ask people for help spelling different words. 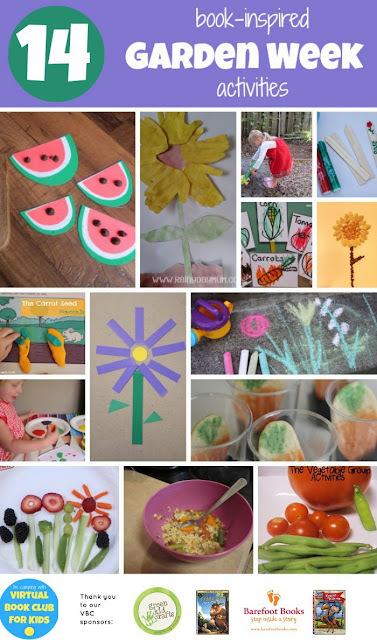 In addition to sharing about garden week on our blogs we have also been pinning ideas that we've found to our Virtual Book Club Summer Camp Pinterest Board. If you've done any garden themed activities this week, come share them on our VBC Facebook wall or tag them with #vbcsummercamp or #gardenweek or #inthegarden and we'll come check them out and share them! If you aren't subscribed to our VBC Summer Camp Weekly Activity Planners yet, you can click here to join our VBC Summer Camp! As a bonus for our VBC Summer Camp "campers" we have three fabulous giveaways arriving in this week's activity planner! All email subscribers can enter the giveaways from Today I Ate a Rainbow, Steve Spangler Science, and Kids Yoga Stories. For Giveaway #1 we are giving away a $50 gift certificate to Steve Spangler Science! Steve Spangler is best known as an author, toy designer, teacher's teacher, professional speaker, Emmy award-winning television personality, Ellen DeGeneres' science guy and creator of a huge soda mess. When is Steve is around, things just happen to fizz, pop, smoke and explode. His passion is to find the most creative ways to make learning fun. The methods might be unconventional, but the goal is to turn ordinary science experiments into unforgettable learning experiences. Steve's company, Steve Spangler Science, provides easy science experiments and kits to do at home or in the classroom to make learning fun. For Giveaway #2 we are giving one lucky reader a Today I Ate a Rainbow Kit. For Giveaway #3 we are giving away a copy of Luke’s Beach Day from Kids Yoga Stories. All three giveaways will go from Friday, July 5th until Thursday, July 11th at 11:59pm PST. Winners will be announced in next Friday’s camp activity planner. Only subscribers to the VBC Camp Activity Planner are eligible to enter these giveaways. 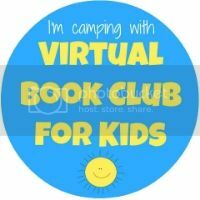 Here's a badge for you to add to your blog if you are participating in Summer Camp! Click on the images and links below to check out more info about our wonderful sponsors! We are also excited to have the support of the following friends of Virtual Book Club! I loved watching the kids sound out new words or ask people for help spelling different words.